Good Morning America has dropped some fantastic news this evening that the full-length trailer for Toy Story 4 will be hitting airwaves tomorrow morning during their morning broadcast — probably around 9:00 AM EST if history is any indication. We predicted in our latest podcast that the trailer would drop this week (whew) and we believe it will be the trailer which was shown at the Disney Annual Meeting of Shareholders. Time will tell if tomorrow morning will bring any new information from the trailer, but be sure to stay tuned and we'll update with information as it's released. As with every Pixar trailer which is released, we will be holding a YouTube Live session to dive into the full breakdown and look for hidden items or plot clues. Catch tour YouTube Live session at 10:00 PM ET / 7:00 PM PT by watching the embedded video below, the trailer post which we'll release tomorrow, or directly on our YouTube channel. 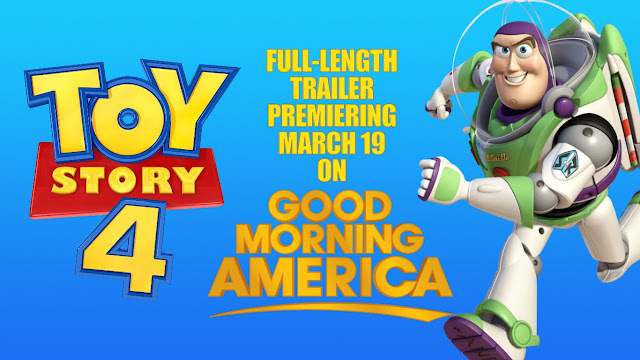 We'll be joined by our friends Dan the Pixar Fan and Giovanni D.
The first full-length trailer for Toy Story 4 will make its debut on Good Morning America tomorrow morning.